Use your own Coffee-Espresso-Hot Cocoa-Tea. 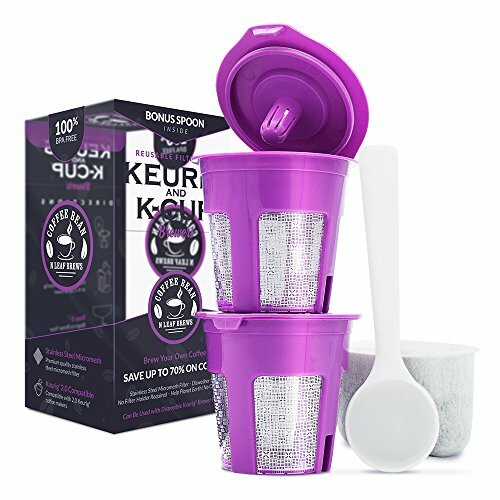 SAVE up to 70% of your MONEY over prepackaged K-Cups! Extract More Flavor. Less Solids in your Mug! • Engineered with a silicone ring on lid to prevent leaking and a stainless steel micro mesh filter designed to keep solids within capsule and not in your mug. No holder needed. Eco-Friendly and Gentle on Mother Earth! So No to Plastic Kcups! Use your own Stash! • Use them in the office! Don't compromise taste with the company's generic brand... or your spouse's Double Coupon Tuesday selection! Rebel with great coffee and brewing perfection! • We offer a World Class customer service experience. We answer all communications, every time. Click the ADD TO CART Button and this Badboy will be on its Way to You! • BRAND NEW 2018 MODEL- No leaks and no error codes guaranteed. BPA free and a NEW Stainless Steel Micro Mesh Filter design for better flavor absorption. Kcup filters are reusable and dishwasher safe. Help Planet Earth with our ECO-FRIENDLY K-Cups. No cup waste! •Our coffee pod outperforms Keurig My K-cup, Ekobrew, Solofill. Kcup pods are refillable. No holder needed. Use your best premium coffee from Starbucks, San Francisco Bay, Illy, McCafe, Kahlua, Café Bustelo, Folgers. Brew black or green tea leaf from Tazo, Lipton, Luzianne. Make iced tea! •Fill and refill with COFFEE LATTE ESPRESSO CAPPUCCINO MOCHA MACCHIATO HOT COCOA TEA. Try half caffeine half decaf. Dark Roast with Italian or French roast. Regular blend with special flavored coffee like hazelnut, vanilla, and caramel. Variety! UP TO 70% MONEY SAVINGS over prepackaged kcups. View More In Reusable Filters. If you have any questions about this product by Coffee Bean N Leaf Brews, contact us by completing and submitting the form below. If you are looking for a specif part number, please include it with your message.